During his first term, Ed had the honor of serving on the Central Racine Co. Health Board, the Parks & Recreation committee and the Joint Parks board. He has also served as chair of the Personnel Committee, overseeing all aspects related to employees, hiring, administrative conditions, and contracts. These opportunities allowed him to be part of important decisions regarding our village and others across the county. Ed has great respect for local governments around us, and together they’ve been able to work together toward common goals while maintaining Caledonia’s priorities. In 2015, a contractor providing public health services to eastern Racine County gave notice they were closing shop. In order to answer their needs, many pressured Racine County to form its own Public Health Department. For years, Caledonia has maintained an agreement with several other villages and towns to provide these public health needs, holding the line on expenses and providing the cheapest public health in Wisconsin. As Racine County explored the creation of this new entity, it was clear we would lose our relative autonomy and our costs would likely skyrocket. Ed was the most outspoken critic of this transfer, and together with others persuaded the rest of the Public Health board to come up with an alternative that maintained our working system while inviting those other communities to take part in our efficient program. WE KEPT PUBLIC HEALTH LOCAL, AFFORDABLE AND EFFECTIVE. Various departments in the village have needed help with backed up improvements and upgrades to the services they’re providing residents. Ed visited with the department heads and sought out ways to improve efficiencies while giving them what they needed to succeed. One such example was the highway department, which has been the exact same size for over 36 years. During this time, responsibilities, demographic changes, regulatory requirements and natural growth have radically increased the demands on our highway department. Through the budget process, Ed made the case that the department needed both physical and financial support for various projects residents requested. Since then, the highway department has added their 14th member to the fleet, the first such addition in over three decades. They are also getting a new garage that will allow them to service more of caledonia quicker, and with better equipment. In the end, EXPENSES STAYED LOW, ROADS ARE SAFER and TAXES REMAINED FLAT. Caledonia has many underutilized parks and natural resources some residents are unaware of. Ed spearheaded the creation of a social media presence that reaches thousands of area residents and helped bring improvements to parks like Nicholson Wildlife Refuge, Gorney Park and Crawford. 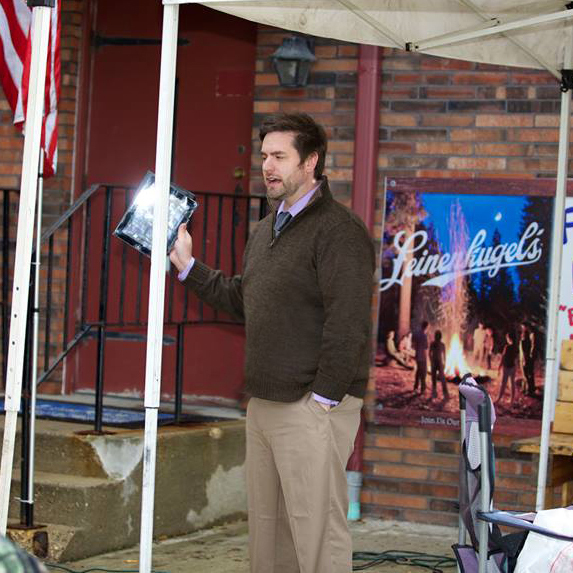 He was also privileged to be a part of the process in bringing Kraut Fest back to Joint Park, the vision of Director Jim Svoboda and an area businessman. This investment has already brought tens of thousands of dollars in upgrades to park infrastructure, access and services. We also saw the addition of a Parks Director in the village, which drastically improved the condition of the parks and our communication with the village. He’s also worked with Oarks President Scott Warner to develop a five year capital plan to double and expand Crawford Park, and improve existing parks across the village. The parks are now more cared for than ever! Ed’s father and all of his uncles spent their careers working in beautiful Milwaukee County parks, and the parks will always have a special place in his heart. WE TREASURE OUR GIFT OF OPEN SPACES. Whether it is an existing TIF (tax incremental financing) district, creation of a new one or incentives for companies to move or expand here, we must keep watch of taxpayers’ dollars and make sure everyone is treated fairly. Ed has a healthy skepticism of TIF districts, and asked the tough questions when necessary to protect hundreds of thousands of public dollars. The expansion of water and sewer lines out to the interstate is one of the most significant projects to ever come to Caledonia, and Ed has followed every step, making sure it costs Caledonia as little as possible while bringing the greatest benefit. EFFICIENCY AND FAIRNESS TAKE VIGILANCE. Caledonia has a rich history as a comfortable, affordable community with vast open spaces and affable neighbors. But many young families that move here for our low taxes and relaxing way of life find themselves challenged by a lack of local employment and a school district not our own. Ed is a firm believer in the future of the village, and forging a unique identity is a crucial part of his goals for Caledonia. This includes affordable expansion of water and sewer to the edges of the village, and an independent school district. We have hundreds of families move here but our population remains stagnant, children leave and businesses avoid moving here because of these two issues: utility investment and education. The reason is that children grow up and move away and businesses go elsewhere to expand where the community is ready for them. Ed is working hard to change that. On April 7th, 2015 the village approved a referendum asking the village to pursue the creation of an independent school district. In December 2015, the board finally approved a public study of the feasibility of this district, with the help of several passionate residents. To this date, the village leadership has still not come through with the study on this, but Ed continues to be a voice on the issue, demanding that the village finally follow up and do what its residents asked for. The future of the village depends on it. He has also been working with local leaders, and our administrator in allowing Caledonia to use its own name in the 53402 ZIP Code. It may not seem a big deal, but such a small detail leaves over half our village unable to identify themselves as Caledonians. Ed wants to change that. 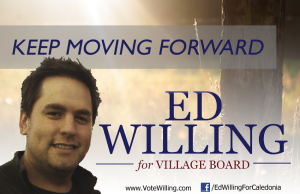 He stands with Caledonia and will do his best to bring lasting change and make the village a destination. CALEDONIA NEEDS ITS OWN IDENTITY.